"NORAD" redirects here. For other uses, see NORAD (disambiguation). North American Aerospace Defense Command (NORAD /ˈnɔːræd/), known until March 1981 as the North American Air Defense Command, is a combined organization of the United States and Canada that provides aerospace warning, air sovereignty, and protection for Northern America. Headquarters for NORAD and the NORAD/United States Northern Command (USNORTHCOM) center are located at Peterson Air Force Base in El Paso County, near Colorado Springs, Colorado. The nearby Cheyenne Mountain Complex has the Alternate Command Center. The NORAD commander and deputy commander (CINCNORAD) are, respectively, a United States four-star general or equivalent and a Canadian three-star general or equivalent. Peterson AFB, Colorado Springs, Colorado, U.S. Both the CONR and CANR regions are divided into eastern and western sectors. The Alaskan NORAD Region (ANR) maintains continuous capability to detect, validate and warn off any atmospheric threat in its area of operations from its Regional Operations Control Center (ROCC) at Joint Base Elmendorf–Richardson, Alaska (which is an amalgamation of the United States Air Force's Elmendorf Air Force Base and the United States Army's Fort Richardson, which were merged in 2010). ANR also maintains the readiness to conduct a continuum of aerospace control missions, which include daily air sovereignty in peacetime, contingency and deterrence in time of tension, and active air defense against manned and unmanned air-breathing atmospheric vehicles in times of crisis. ANR is supported by both active duty and reserve units. Active duty forces are provided by 11 AF and the Canadian Armed Forces (CAF), and reserve forces provided by the Alaska Air National Guard. Both 11 AF and the CAF provide active duty personnel to the ROCC to maintain continuous surveillance of Alaskan airspace. Canadian NORAD Region Headquarters is at CFB Winnipeg, Manitoba. It was established on 22 April 1983. It is responsible for providing surveillance and control of Canadian airspace. The Royal Canadian Air Force provides alert assets to NORAD. CANR is divided into two sectors, which are designated as the Canada East Sector and Canada West Sector. Both Sector Operations Control Centers (SOCCs) are co-located at CFB North Bay Ontario. The routine operation of the SOCCs includes reporting track data, sensor status and aircraft alert status to NORAD headquarters. 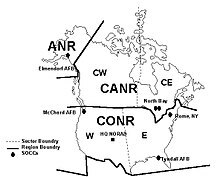 In 1996 CANR was renamed 1 Canadian Air Division and moved to CFB Winnipeg. Canadian air defense forces assigned to NORAD include 409 Tactical Fighter Squadron at CFB Cold Lake, Alberta and 425 Tactical Fighter Squadron at CFB Bagotville, Quebec. All squadrons fly the McDonnell Douglas CF-18 Hornet fighter aircraft. To monitor for drug trafficking, in cooperation with the Royal Canadian Mounted Police and the United States drug law enforcement agencies, the Canadian NORAD Region monitors all air traffic approaching the coast of Canada. Any aircraft that has not filed a flight plan may be directed to land and be inspected by RCMP and Canada Border Services Agency. The Continental NORAD Region (CONR) is the component of NORAD that provides airspace surveillance and control and directs air sovereignty activities for the Contiguous United States (CONUS). CONR is the NORAD designation of the United States Air Force First Air Force/AFNORTH. Its headquarters is located at Tyndall Air Force Base, Florida. The First Air Force (1 AF) became responsible for the USAF air defense mission on 30 September 1990. AFNORTH is the United States Air Force component of United States Northern Command (NORTHCOM). 1 AF/CONR-AFNORTH comprises Air National Guard Fighter Wings assigned an air defense mission to 1 AF/CONR-AFNORTH on federal orders, made up primarily of citizen Airmen. The primary weapons systems are the McDonnell Douglas F-15 Eagle and General Dynamics F-16 Fighting Falcon aircraft. It plans, conducts, controls, coordinates and ensures air sovereignty and provides for the unilateral defense of the United States. 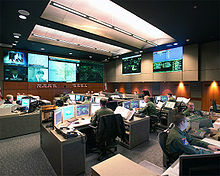 It is organized with a combined First Air Force command post at Tyndall Air Force Base and two Sector Operations Control Centers (SOCC) at Rome, New York for the US East ROCC (Eastern Air Defense Sector) and McChord Field, Washington for the US West ROCC (Western Air Defense Sector) manned by active duty personnel to maintain continuous surveillance of CONUS airspace. In its role as the CONUS NORAD Region, 1 AF/CONR-AFNORTH also performs counter-drug surveillance operations. The United States Pacific Command (PACOM) would make the determination that an inbound missile is a threat to the United States in the Pacific Region. Hawaii is the only state in the United States with a pre-programmed Wireless Emergency Alert that can be sent quickly to wireless devices if a ballistic missile is heading toward Hawaii. If the missile is fired from North Korea, the missile would take approximately 20 minutes to reach Hawaii. PACOM would take less than 5 minutes to make a determination that the missile could strike Hawaii and would then notify the Hawaii Emergency Management Agency (HI-EMA). HI-EMA would issue the Civil Defense Warning (CDW) that an inbound missile could strike Hawaii and that people should Shelter-in-Place: Get Inside, Stay Inside, and Stay Tuned. People in Hawaii would have 12 to 15 minutes before impact. Federal Emergency Management Agency (FEMA) is not required to be notified for approval to cancel an alert. Signal carriers allow people to block alerts from state and law enforcement agencies, but not those issued by the President. FEMA can send alerts to targeted audiences but has not implemented this as of January 2018. Other states can take as long as 30 minutes to create, enter and distribute a missile alert. The nationwide system for Wireless Emergency Alerts to mobile devices was tested for the first time on October 3, 2018. The North American Air Defense Command was recommended by the Joint Canadian–U.S. Military Group in late 1956, approved by the U.S. Joint Chiefs of Staff in February 1957, and announced on 1 August 1957. NORAD's command headquarters was established on 12 September 1957 at Ent Air Force Base's 1954 blockhouse. In 1958, Canada and the United States agreed that the NORAD commander would always be a United States officer, with a Canadian vice commander, and Canada "agreed the command's primary purpose would be…early warning and defense for SAC's retaliatory forces. 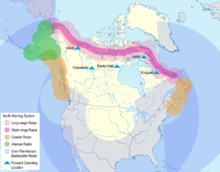 ":252 In late 1958, Canada and the United States started the Continental Air Defense Integration North (CADIN) for the Semi-Automatic Ground Environment air defense network. :253 The initial CADIN cost sharing agreement between the two countries was signed off on 5 January 1959. Two December 1958 plans submitted by NORAD had "average yearly expenditure of around five and one half billions", including "cost of the accelerated Nike Zeus program" and three Ballistic Missile Early Warning System (BMEWS) sites. 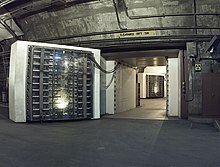 The 25-ton North blast door in the Cheyenne Mountain nuclear bunker is the main entrance to another blast door (background) beyond which the side tunnel branches into access tunnels to the main chambers. Canada's NORAD bunker at CFB North Bay with a SAGE AN/FSQ-7 Combat Direction Central computer was constructed from 1959 to 1963, and each of the USAF's eight smaller AN/FSQ-8 Combat Control Central systems provided NORAD with data and could command the entire United States air defense. The RCAF's 1950 "ground observer system, the Long Range Air Raid Warning System", was discontinued and on 31 January 1959, the United States Ground Observer Corps was deactivated. :222 The Cheyenne Mountain nuclear bunker's planned mission was expanded in August 1960 to "a hardened center from which CINCNORAD would supervise and direct operations against space attack as well as air attack" The Secretary of Defense assigned on 7 October 1960, "operational command of all space surveillance to Continental Air Defense Command (CONAD) and operational control to North American Air Defense Command (NORAD)". The JCS placed the Ent Air Force Base Space Detection and Tracking System (496L System with Philco 2000 Model 212 computer) "under the operational control of CINCNORAD on December 1, 1960"; during Cheyenne Mountain nuclear bunker excavation, and the joint SAC-NORAD exercise "Sky Shield II"—and on 2 September 1962—"Sky Shield III" were conducted for mock penetration of NORAD sectors. United States Department of Defense realignments for the NORAD command organization began by 15 November 1968 (e.g., Army Air Defense Command (ARADCOM)) and by 1972, there were eight NORAD "regional areas ... for all air defense", and the NORAD Cheyenne Mountain Complex Improvements Program (427M System) became operational in 1979. On at least three occasions, NORAD systems failed, such as on 9 November 1979, when a technician in NORAD loaded a test tape, but failed to switch the system status to "test", causing a stream of constant false warnings to spread to two "continuity of government" bunkers as well as command posts worldwide. On 3 June 1980, and again on 6 June 1980, a computer communications device failure caused warning messages to sporadically flash in U.S. Air Force command posts around the world that a nuclear attack was taking place. During these incidents, Pacific Air Forces (PACAF) properly had their planes (loaded with nuclear bombs) in the air; Strategic Air Command (SAC) did not and took criticism[by whom? ], because they did not follow procedure, even though the SAC command knew these were almost certainly false alarms, as did PACAF. Both command posts had recently begun receiving and processing direct reports from the various radar, satellite, and other missile attack detection systems, and those direct reports simply did not match anything about the erroneous data received from NORAD. The North Warning System as envisioned by Canada and the US in 1987. NORAD/USNORTHCOM Alternate Command Center prior to the Cheyenne Mountain Realignment. Following the 1979 Joint US-Canada Air Defense Study, the command structure for aerospace defense was changed, e.g., "SAC assumed control of ballistic missile warning and space surveillance facilities" on 1 December 1979 from ADCOM. :48 The Aerospace Defense Command major command ended 31 March 1980. and its organizations in Cheyenne Mountain became the "ADCOM" specified command under the same commander as NORAD, e.g., HQ NORAD/ADCOM J31 manned the Space Surveillance Center. By 1982, a NORAD Off-site Test Facility was located at Peterson AFB. The DEW Line was to be replaced with the North Warning System (NWS); the Over-the-Horizon Backscatter (OTH-B) radar was to be deployed; more advanced fighters were deployed, and E-3 Sentry AWACS aircraft were planned for greater use. These recommendations were accepted by the governments in 1985. The United States Space Command was formed in September 1985 as an adjunct, but not a component of NORAD. NORAD was renamed North American Aerospace Defense Command in March 1981. In 1989 NORAD operations expanded to cover counter-drug operations, for example, tracking of small aircraft entering and operating within the United States and Canada. DEW line sites were replaced between 1986 and 1995 by the North Warning System. The Cheyenne Mountain site was also upgraded, but none of the proposed OTH-B radars are currently in operation. After the September 11, 2001 attacks, the NORAD Air Warning Center's mission "expanded to include the interior airspace of North America." The Cheyenne Mountain Realignment was announced on 28 July 2006, to consolidate NORAD's day-to-day operations at Peterson Air Force Base with Cheyenne Mountain in "warm standby" staffed with support personnel. 1955 Sears ad with the misprinted telephone number that led to the NORAD Tracks Santa Program. NORAD Tracks Santa follows Santa Claus' Christmas Eve journey around the world. The NORAD command center located under Cheyenne Mountain, Colorado is a setting of the 1983 film WarGames and the television series Jeremiah and Stargate SG-1. As a publicity move on December 24, 1955, NORAD's predecessor, the Continental Air Defense Command (CONAD), informed the press that CONAD was tracking Santa Claus's sleigh, adding that "CONAD, Army, Navy and Marine Air Forces will continue to track and guard Santa and his sleigh on his trip to and from the U.S. against possible attack from those who do not believe in Christmas", and a Christmas Eve tradition was born, known as the "NORAD Tracks Santa" program. Every year on Christmas Eve, "NORAD Tracks Santa" purports to track Santa Claus as he leaves the North Pole and delivers presents to children around the world. Today, NORAD relies on volunteers to make the program possible. Main Centre for Missile Attack Warning, a Soviet/Russian equivalent. ^ "Canada's CF-18 Hornets". CBC News. 21 March 2011. ^ "CBC Archives". 10 April 2013. ^ a b c Schaffel, Kenneth (1991). Emerging Shield: The Air Force and the Evolution of Continental Air Defense 1945-1960 (45MB PDF). General Histories (Report). Office of Air Force History. ISBN 0-912799-60-9. Retrieved 26 September 2011. ^ Sturdevant, Rick W (1995). "Chapter 7: The United States Air Force Organizes for Space: The Operational Quest". In Launius, Roger D (ed.). Organizing for the Use of Space: Historical Perspectives on a Persistent Issue (Report). AAS History Series. Volume 18. Univelt for the American Astronautical Society. ISSN 0730-3564. ^ Weeden, Brian C; Cefola, Paul J. Computer Systems and Algorithms for Space Situational Awareness: History and Future Development (PDF) (Report). SWFound.org. Retrieved 2 September 2012. ^ Renuart, Victor E., Jr. (2009). "The Enduring Value Of NORAD". Joint Force Quarterly. 54: 92–6. ^ a b Del Papa, Dr. E. Michael; Warner, Mary P (October 1987). A Historical Chronology of the Electronic Systems Division 1947-1986 (PDF) (Report). Retrieved 19 July 2012. McNamara…reasoned that Soviet missiles could eliminate air defense systems in a first strike ... the policy that emerged [sic] embraced the most extreme option: massive retaliation, popularly referred to ... as mutual assured destruction (MAD). ... 1966…NORAD ... Combat Operations Center ... integrated several distinct systems into a single workable unit to provide the NORAD Commander with the necessary information and control to perform his mission. ... the Space Defense Center combining the Air Force's Space Track and the Navy's Spasur. ^ title tbd (PDF) (Report). On November 15, 1968, as part of the internal reorganization of the Army Air Defense Command (ARADCOM), the 47th Artillery Brigade was transferred east. the Army Air Defense command at Fort MacArthur became the 19th Artillery Group (Air Defense). This change was made to align ARADCOM units in accordance with a reorganization of the North American Air Defense Command (NORAD). ^ "Chapter 1: Air Defense Doctrine and Procedures". U.S. Army Air Defense Digest, 1972. Hillman Hall, Fort Bliss, Texas. 1972. North American Air Defense Command. Retrieved 19 September 2012. Currently, the North American Continent is divided into eight regional areas (fig 2) of air defense responsibility· Each region commander is responsible to CINCNORAD for all air defense activity within his designated area. … The average number of unknowns in the system has steadily declined over the years until now the number is approximately 40 per month. ^ "Cheyenne Mountain Upgrade (CMU)". FY97 DOT&E Annual Report (webpage transcription of chapter) (Report). Retrieved 9 September 2012. CMU also upgrades and provides new capability to survivable communication and warning elements at the National Military Command Center (NMCC), U.S. Strategic Command (USSTRATCOM), and other forward user locations. CMU additionally provides at Offutt, AFB an austere backup to Cheyenne Mountain ballistic missile warning. … Granite Sentry provides a Message Processing Subsystem and a Video Distribution Subsystem, and it upgrades the NORAD Computer System display capability and four major centers: (1) the Air Defense Operations Center, (2) the NORAD Command Center, (3) the Battle Staff Support Center, and (4) the Weather Support Unit. Granite Sentry also processes and displays nuclear detection data provided from the Integrated Correlation and Display System. ^ "NORAD's Missile Warning System: What Went Wrong? (MASAD-81-30)" (PDF). U.S. Government Accountability Office. 15 May 1981. Retrieved 3 November 2010. "Attack Warning: Better Management Required to Resolve NORAD Integration Deficiencies (IMTEC-89-26)" (PDF). U.S. Government Accountability Office. 7 July 1989. Retrieved 3 November 2010. ^ Winkler, David F; Webster, Julie L (June 1997). Searching the Skies: The Legacy of the United States Cold War Defense Radar Program (Report). U.S. Army Construction Engineering Research Laboratories. Retrieved 26 March 2012. ^ "Brigadier General David A. Cotton". U.S. Air Force. Archived from the original on 12 December 2012. Retrieved 17 December 2012. ^ "Report" (PDF). gao.justia.com. 1991. ^ "Cheyenne Mountain Complex". NORAD Public Affairs. AWC [Air Warning Center]. Archived from the original on 5 October 2012. Retrieved 9 September 2012. ^ D'Agostino, Davi M (21 May 2007). Defense Infrastructure: Full Costs and Security Implications of Cheyenne Mountain Realignment Have Not Been Determined [GAO--07-803R] (PDF) (Report). United States General Accounting Office. Retrieved 9 September 2012. ^ Kirk Johnson (29 July 2006). "After 4 Decades, a Cold War Symbol Stands Down". New York Times. Retrieved 31 December 2009. ^ "North American Aerospace Defense Command – NORAD Tracks Santa". NORAD. Retrieved 13 May 2014. ^ "Eastern Air Defense Sector to Track Santa Claus on Christmas Eve: New York Air Guardsman Once Again Will Help NORAD Track Santa" (Press release). New York State Division of Military and Naval Affairs. 24 December 2013. Retrieved 13 May 2014. ^ Pellerin, Cheryl. "NORAD Gears Up to Track Santa Claus". Informatics. Scientific Computing. Retrieved 8 December 2011. ^ Appelbaum, Yoni (24 December 2015). "Where Does NORAD's Santa Tracker Really Come From?". theatlantic.com. ^ "NORAD Tracks Santa". NORAD.mil. Archived from the original on 24 December 2009. Wikimedia Commons has media related to North American Aerospace Defense Command.